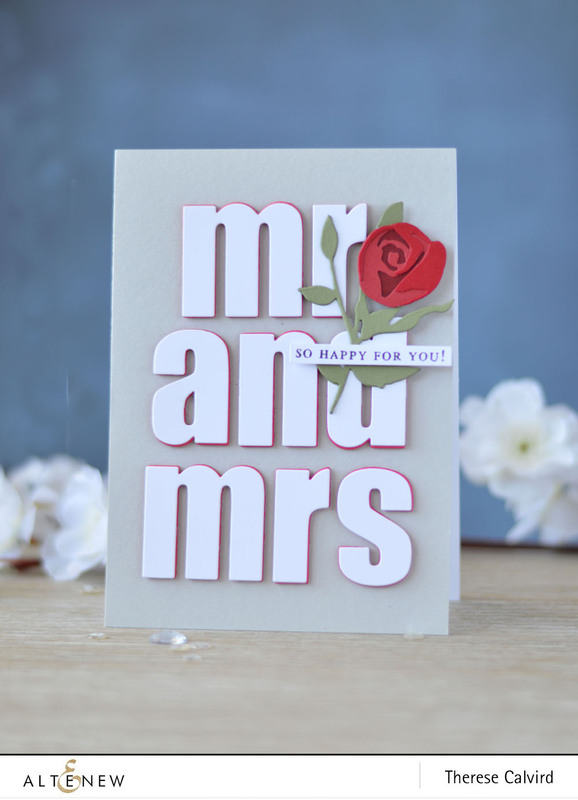 Rose Flurries 3D Die Wedding Design – Video! Hi, it’s Therese and I have yet another card and video to share. Today I have the Rose Flurries 3D Die Set out and I was wondering if you are loving these too? I created a clean and simple wedding card design and thought that a single stemmed rose would be perfect. Then a big Bold Alphabet Sentiment felt just right, popped up on a Pale Gray Cardstock card base. And finally I added a small sentiment from the Build-A-Flower: Magnolia Stamp Set. I decided to film the process while I created. Perfect card! Elegant & beautiful! Therese, This card is just STUNNING, I ADORE how it came out! The colors are so pretty, love that flower and the red peaking out, and I love the Bold Alpha die, I have that set and love, love it. Beautiful card, thanks for your video! This is beautiful and I liked it on the black, too! These layering floral dies from Altenew are fun and look beautiful when assembled. I have the Fantasy Floral Layering die and love using it! I agree these flower dies are wonderful, I also know that I ‘need ‘the Floral Fantasy die myself hopefully soon. Stunning card!! I ordered those awesome letters but couldn’t get hold of those rose die cuts before they sold out!! Hopefully they will be back in store real soon. Really love the red outline of the letters, nice touch! Truly lovely card and excellent video!! I must admit-I struggle with dies-don’t know why. I’m loving dies more and more. .. but I still adore my stamps. Great card, I love it on grey. I didn’t use grey before I saw you using it often and tried it also and loved it. So I use it also often lately. Thanks for this great idea, its often difficult certainly for a “funky” couple. Glad to hear that you are enjoying the ‘grey’ too, I find it goes with most colors it’s such a fab neutral. I left a comment on your Youtube of this card Therese but had to comment again. Yes, the big bold alphabets are just fantastic and NEED to get my hands on both the lower and upper case. At the moment I’m just drawing them and cutting them out with scissors, but of course they don’t have that delicious “finished” look about them. Also NEED all of the 3D dies, in fact I NEED the whole release, hehehehe. You’re so lucky you’re such a talented girl and get to be a designer and be given the privilege of playing with all this deliciousness. From one Aussie to another. TFS. Bev. Thank you so much Bev, and yes I do feel very lucky to be on this design team, everything about the team and company is wonderful! What a beautiful card for a wedding! I vote for gray as well. It looks so pretty with the red in the rose. 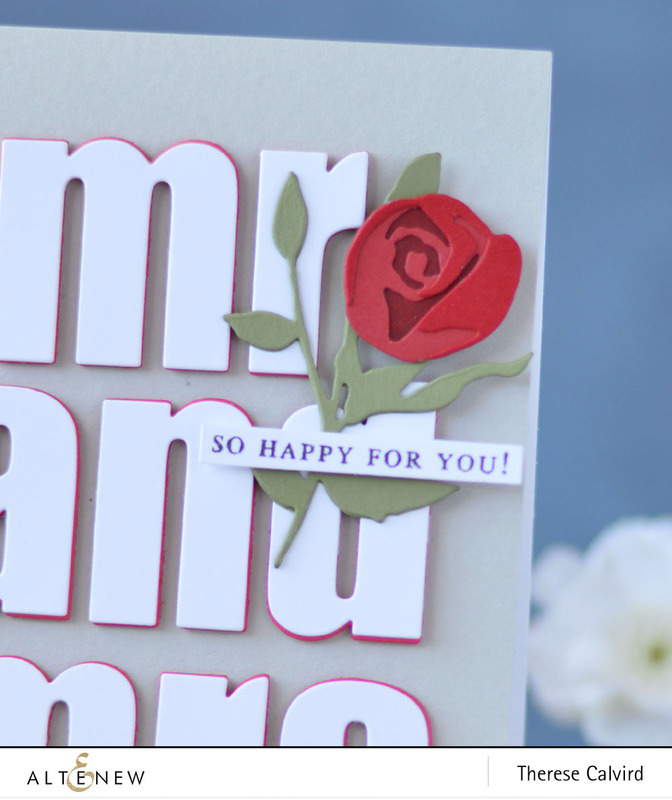 Using the single rose and leaf spray really makes the card elegant. Beautiful and loved that rose! Love the gray! Love this idea. (and the grey card) Had to buy the alphabet dies after seeing this. I’m trying this with different colourways, words and flowers and all look great! Thanks. Love this card, Therese! Definitely prefer the gray card stock – it’s classy, & the red fun foam behind the letters is a great touch. Love the clean & simple look – simply beautiful! Therese, thanks for sharing this lovely card and video tutorial. As I mentioned on my comment there, I think the grey wins out but I’d also try a matte silver cardstock for such a special occasion.